A row has broken out in Bolivia between the government and army veterans over the 50th anniversary of the death of the Cuban revolutionary, Ernesto "Che" Guevara. A spokesman for the army veterans who fought Che's forces said they would not take part in the official ceremonies. Government officials have said they expect the veterans to attend the commemorations. Che Guevara, one of Cuba's most important ideologues, was captured on the 8 October 1967 and shot dead the next day by Bolivian government troops. 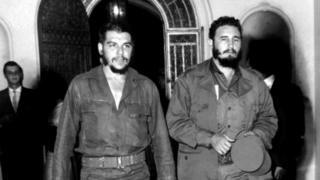 He had left Cuba to establish guerrilla groups elsewhere in Latin America. Local media reported that Mario Moreira, who represents the veterans, said: "We will not attend the commemorations because we think it has become rather political. How can we pay homage to them [the Cuban guerrillas]? "The Bolivian state, which represents the people, has the obligation to pay homage to us, we defended the nation and 59 soldiers gave their lives." The Bolivian army fought a bitter battle against Che's small force of 47 men between 1966 and 1967 which ended when Che was captured and killed. The veterans have rejected suggestions by Minister of Defence Reymi Ferreira who said that the commemorations were to be a way of "healing wounds" between Bolivia and Cuba. However, Mr Moreira said that it wasn't possible to pay tribute to "a foreigner who had caused pain and grief to Bolivian families". "If Che had won, our country would be different. Thanks to us we have legally constituted governments." He said the veterans planned to take part in a mass to remember their dead. Bolivia is a political ally of Cuba and the left-wing government of President Evo Morales and the Caribbean island have close political and diplomatic relations.